You don’t have to rough it in the outdoors at Yosemite National Park- not when you stay at Tenaya Lodge, at least. The four-diamond property touts luxurious, recently renovated guestrooms and suites, plus cottages, the latter of which will receive an update in 2016. Cottages are particularly ideal for families, with a sense of privacy, yet a sense of closeness to all of the resort’s activities- and activities and programs there are. 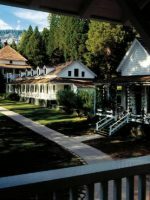 Tenaya Lodge offers several swimming pools (including one just for kids), archery, rock climbing, horseback riding, kids’ camps, guided hikes and train rides and gold panning at Sugar Pine Mountain Railroad, located down the street. In the winter months (you didn’t think that was all, did you? ), there’s ice-skating, sledding and kids’ snowmobile tours, plus skiing, snowshoeing and tubing at nearby Badger Pass. The list continues — there are six onsite restaurants, including highly acclaimed Embers, along with a world-class spa (and babysitting services should you need them while you enjoy a heavenly massage). The only problem will arise when it’s time to yank the kids from the pool. They could easily spend their entire vacation at the resort, but it’s impossible to ignore the main attraction: Yosemite National Park. The south entrance is just 2 miles away, and you can even arrange a guided tour there via the resort. What’s not to love? Many guestrooms and suites at Tenaya Lodge were updated in 2015, with other accommodations set for renovations in the near future. Amenities include mini-fridges, coffeemakers, hairdryers, irons and ironing boards, safes, clock radios, work desks (which easily double as eating spaces) and individual climate control. 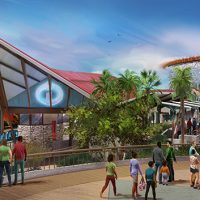 Free Wi-Fi, complimentary newspapers and rollaway beds and cribs are included in a nightly resort fee of $15. Deluxe Rooms span 330 square feet and include one king or two queen beds outfitted in comfy duvet covers. Premium Rooms are slightly larger at 350 square feet, and include a choice of two queen beds or one king bed. Bathrooms are spacious and luxurious, with granite countertops and shower-tub combinations in a separate area -- privatized by wooden, sliding doors. These rooms are ideal for families, with 450 square feet of space and beds for up to six guests - two queen beds and one sofa bed. They also feature balconies. The Junior Room provides more living space, with a separate bedroom and living area. It's suitable for couples with a king bed, but also for families - the living area has a sofa bed. The Junior Room is 425 square feet. Spa Rooms are best for couples, since their main features are giant whirlpool tubs and balconies. However, they can accommodate up to four guests in one king bed and one sofa bed. They are 550 square feet. Up to four people can comfortably fit in Deluxe Suites, with one king bed and one sofa bed available. This room is 650 square feet in size and includes a wet bar. The Luxury Suite spans 850 square feet, though it only accommodates up to four guests in one king bed and one sofa bed. Still, it's a nice option for large groups who might want to gather in one space to enjoy a meal -- there's an eight-person table -- or play board games. The room also features two balconies. Additionally, the hotel offers gorgeous Adults-Only Luxury Suites -- consider one of them for a no-kids-allowed getaway. If you want a private space in the great outdoors, opt to stay in a Cottage Room, which offers two queen beds or a king bed and 330 square feet of space. These rooms also feature balconies or patios. These are ideal for families, with a separate bedroom that houses a queen bed and a sofa bed or a king bed in the living room. The Cottage Suites are 490 square feet. Note: Guests have to walk up a staircase to get to these rooms. Nice place to return to after a long day of hiking. I researched many hotels throughout the Yosemite area before settling on this one. Glad we chose this one over the Majestic. While the Majestic is perfectly situated inside the valley with a zero need for driving during a stay, I found the hotel to be seriously overpriced and not particularly cozy(we visited it before the start one of our hikes). The Tenaya Lodge is just under an hour drive from the beginning of the Valley (tunnel view), a few minutes drive from the southern Yosemite entrance as well as the not to be missed Mariposa Grove of the Giant Sequoias. The Lodge suited all of our needs perfectly. Food - we ate all breakfasts and dinners at hotel. Good food & nice staff everywhere including the takeaway cafe. Although service was extremely slow. However, I think the slow service was mainly due to new season/new staff which is understandable. We were in no rush especially after long days of hiking. The Lodge was also wrapping up a major renovation within the main dining area which had the bar in a different location. Required the staff to travel farther for adult beverages. Again, understandable situation that is likely over by the time this review is posted. Pools - nice indoor pool. Unfortunately, we never had time or energy to use it. Outdoor looked nice too. Not yet opened up for the season. Laundry area-a life saver. Was able to wash all of our airplane clothes:). Room - our room was in the west wing, very close to the elevator and stairs. Easy access which we loved. The room was lovely, large and spotless. Poor service but lovely surroundings. Welcomed by Captain miserable on the desk and lieutenant grumpy in the restaurant wait area. No - as a guest you Can't book a table! Complained on first night about problem with room but nothing done. Restaurant actual service is good. 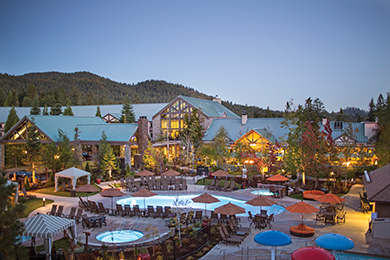 Tenaya Lodge has three outdoor pools and two indoor pools -- you'll be hard-pressed not to find one you like! Outside, there's a traditional pool surrounded by cabanas, along with a kids' pool with mushroom water features; both are located near Bearfoot Bar. Nearby, there's an adults-only pool (good for relaxing, but not for swimming, at 3.5 feet in depth). Inside Tenaya Lodge, there's another large pool. The fifth pool is located by the Cottages of Tenaya Lodge -- a convenience for guests of those accommodations. Complimentary swim diapers and toys are provided at all pools. In addition to five pools, the property has five hot tubs, two of which are designated for adults only. Next to the indoor pool at Tenaya Lodge is an arcade with some pretty impressive games -- Dance Dance Revolution, SEGA House of the Dead 2 and Terminator Salvation, plus staples like pool and air hockey tables and a claw machine. Visit Yosemite Sugar Pine Mountain Railroad, approximately 2 miles from Tenaya Lodge. There, you can ride a steam train or powered rail car, pan for gold, eat barbecue favorites and more. It's open in the spring, summer and fall, 9:30 a.m. to 3:30 p.m. daily. Rates vary by attraction. Tenaya Lodge has a small, outdoor rocking climbing wall, open daily in the spring, summer and fall (though closed when it rains). Rates are $10 per person for 30-minute sessions, and hours are 9 a.m. to 5:30 p.m. Kids must weigh at least 45 pounds to participate. The archery program is available to everyone ages 5 and up, with kid-size gear for youngsters. The cost is $10 per 30-minute session, and hours are 10 a.m. to 5:30 p.m.
Horseback riding is available May through November. Excursions last about an hour and cost $45 per person. Riders must be at least 7 years old and 46 inches tall. 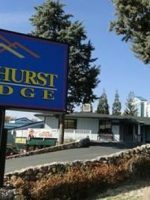 Hours are 8 a.m. to 5 p.m.
Called the Sierra Adventure Club, the hotel's traditional kids' camp includes everything from rock wall climbing in the summertime to sledding in the winter months. The cost is $40 per child (for three hours), ages 5 to 12, and covers a picnic lunch. Sierra Adventure Club is available 10 a.m. to 1 p.m. daily, Memorial Day through Labor Day, and then on Saturdays and Sundays the remainder of the year. Kids Camp is Tenaya Lodge's nighttime program for youngsters. It's especially popular for parents who want to enjoy a date night at Embers. Activities include arts and crafts, movies and games. Kids Camp operates 5:30 to 9:30 p.m. daily, Memorial Day through Labor Day, and on weekends the rest of the year. It costs $50 per child, for four hours. In the winter months, the hotel opens a small ice-skating rink. Whirl a few rounds on the rink, and then warm up by the fire pit. The ice-skating rink is open daily, 9 to 11 a.m. and 6 to 9 p.m.
You can rent skis or snowshoes to use at nearby Badger Pass, or you can buy a sledding disc to enjoy right at the resort. The resort has a few hills, with smaller slopes for little ones. Tenaya Lodge offers kids' rides on Arctic Cat Junior Snowmobiles, 10 a.m. to 4 p.m. on Fridays, Saturdays and Sundays. Children must be at least 6 years of age and no larger than 5 feet tall and 115 pounds. Sessions last 40 minutes and cost $40. 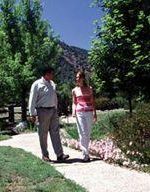 The hotel offers several guided hikes -- inquire at the front desk. One of the most popular is the flashlight hike. It lasts about an hour and terrain is generally easy to navigate (there are a few hills). Rates range from $15 to $25 per person for guided hikes. It's the most popular option for families at Tenaya Lodge, with a casual, cozy ambience that's completed by a limestone fireplace. Breakfast and dinner are served daily, with a kids' menu available for both. Breakfast includes a bountiful buffet and a la carte options, while dinner covers steaks, seafood and pasta. Also, plenty of options are available for those with dietary restrictions. Hours at Sierra Restaurant vary upon season. Jackalope's is another popular option for families, with comfort food on offer -- choose from a menu of burgers, sandwiches and salads, plus gluten-free and vegan entrees. The restaurant also offers a kids' menu, and crayons and paper are provided. Tip: Try a local drink from Idle Hour Winery or South Gate Brewery while at Jackalope's -- both are located just down the road from Tenaya Lodge. Hours of operation depend upon season. Reservations can be made for groups of six or more. Bearfoot Bar serves refreshing cocktails and draft beers by the pool, plus light fare. Try the Apple Burger! Bearfoot Bar is open during the summer months, with varied hours. 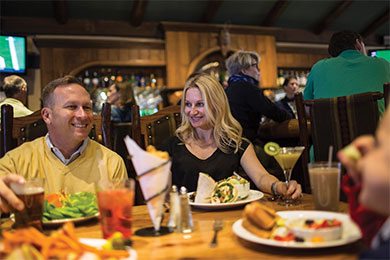 Located by the Tenaya Lodge Cottages, Timberloft Pizzeria offers brick-oven pizzas, a salad bar and desserts, plus a pasta dish just for kids. You can also order beer or wine to enjoy with your meal. Hours vary by season. Embers is upscale dining like you've never experienced. The presentation of meals is as good as the food itself -- order the Flaming Coffee and Bananas Diablo for the ultimate show. Don't miss the lobster bisque either! Reservations are required for Embers, which is open seasonally. Embers is geared toward adults, so children must be at least 12 years old to dine here. This is the perfect place to go for an afternoon or late-night snack. Grab a sandwich, snack or beverage. Milkshakes, smoothies, coffee drinks and pastries are also available. In-room dining is available year-round. Winter hours are 7 a.m. to 9 p.m. and summer hours are 6:30 a.m. to 11 p.m. The hotel charges a "Resort Services Fee," which covers Wi-Fi, valet and self parking, business center access, unlimited phone calls (toll free and local), newspaper delivery daily, in-room coffee and tea, fitness center access (including saunas and steam rooms), access to pools, rollaway beds and cribs and nightly turn-down service (upon request). It also includes two complimentary bottles of water. The fee is $15 per night. Babysitting is available for infants and children up to 12 years of age, with services available from 8 a.m. to 10 p.m. daily. Advance notice is required. There's a small gift shop near the lobby, where you can purchase typical souvenirs -- shirts, ornaments, postcards and more. Part of Ascent Spa, the fitness center is open daily, 6 a.m. to 10 p.m. Saunas, steam rooms and locker rooms are also available. There's an onsite laundry facility, where detergent is also available for purchase. Washers and dryers cost $2 per use. Tenaya Lodge welcomes dogs, and even has a Deluxe Pampered Pet Package that includes a water bowl, bed, toy, gourmet treat, pet-sitting service (two hours) and more. 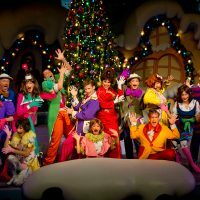 In addition to the Deluxe Pampered Pet Package, the hotel offers several other packages, including a Discover Yosemite Tour Package and Family Fun Package. Tenaya Lodge is most popular during the summer months, especially since it offers such a wide range of outdoor activities outside of Yosemite National Park. If you're willing to forgo the outdoor pools, visit in March, April, October or November -- you'll enjoy lower rates and fewer crowds. 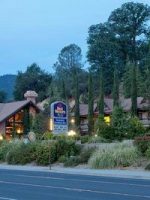 Tenaya Lodge is approximately 1.5 hours from Fresno Yosemite International Airport, and the only way to get there is by car. All major car rental companies are available at the airport. Free parking is provided at the hotel, and you'll absolutely need a car to get around Yosemite National Park. Alternatively, you can take a bus tour via Discover Yosemite. Several different excursions are available -- reserve in advance of your trip. Enjoy a treatment at Ascent Spa -- options are innumerable, with everything from couples massages to antioxidant scrubs. Be sure to reserve some time for the saunas and steam rooms, too. Afterward, head to Embers for a romantic, upscale dining experience.